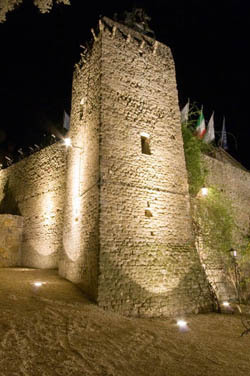 This ancient square stone tower, which dates back to the darkest times of the Middle Ages (the 12th century), is an integral part of the oldest section of the Castello di Castelleone. Nestled at the turning point of the massive walls of the castle, it rises sternly keeping guarded watch on the valley below. Small windows and arrow slits bear witness to its military origins and are a tangible sign of its important history as primary defence mechanism of the Castle. The tower has five rooms, one above the other, as well as a magnificent terrace overlooking the lower end of the park and the swimming pool. A wide rampart crowns the wall and, at the very top of the tower, a belvedere gives onto the entire Tiber Valley, with unforgettable views of Perugia, Deruta and Todi. Inside the Longobard Tower the spaces are divided into two bathrooms on the ground level, a single bedroom and three double bedrooms on the second to the fifth floor, all connected by a characteristic circular staircase carved into the stone interior walls. Unlike the sumptuousness and elegance of the noble floor of the main Castle, these rooms are more spartan and essential. The beds and furniture are all antique, the naked walls are the same stone the tower is made of and the narrow window slits of military origin take us back in time to when life was simple and the wars were a reality of daily medieval life. The Longobard Tower connects to the courtyard and the ancient porticoes of the Castle via a door at its top, while the ground floor door leads directly to the magnificent swimming pool.